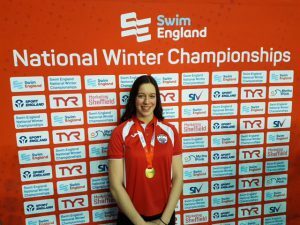 What a way to end a fantastic year for both Elena Dewhurst and Anaconda Swimming Club! 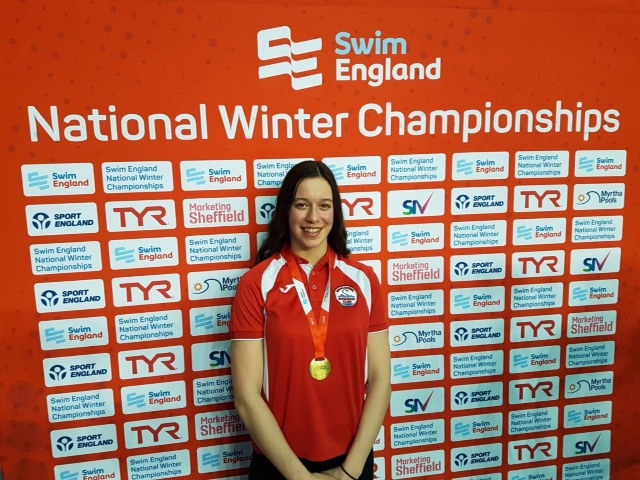 Elena once again proved her worth at national level by winning Gold in the Junior (under 16) 50m freestyle and was also the recipient of the Ray Clash trophy presented to the fastest female junior freestyler at the National Winter Championships. Elena recorded a personal best time of 26.79 in her heat which placed her in joint 20th position, this meant that Anaconda’s speed queen had to take part in a swim off to qualify for the Womens Open B final. Although Elena was touched out in the swim off she gave her Loughborough University opponent plenty to worry about in the race. Elena also swam a personal best in the 50m butterfly, winning her heat in 29.03 to finish 31st and recorded a time of 59.91 in the 100m freestyle, although not a personal best it was still a very strong swim. A fantastic 2017 for Elena and everyone at Anaconda SC as the club keeps on improving on all fronts which is down to Wayne and all of his coaching staff at the club, not forgetting Lesley and her staff in the teaching pool and of course the swimmers for all their hard work throughout the year, lets see what happens in 2018! #alwaysmovingforward.